Kodi 17.6, also known as ‘Krypton’, has now been released. This update to the popular media-playing software brings a new look and a whole host of improved features, and in this guide we’ll show you how to update (or perform a clean install of) Kodi Krypton. Kodi is available on a huge range of devices and platforms, including Windows PC, Mac, Linux, Android and iOS. If you want an easy and convenient way to view your digital media throughout your home, or legally stream media from a huge range of sources around the internet, then you’ll want to install Kodi 17.6 Krypton. We’ll also show long-time Kodi users how to update their existing installation of Kodi to Krypton, so that you can make use of all the fantastic new features of Kodi 17.6. Kodi got even more versatile with the Krypton update. However, if you really want to get the most out of Kodi, you should be using it with a VPN. That way you can get around annoying geoblocks that keep you from accessing all the great content in the world. Not sure which VPN to choose? The Techradar best VPN has your covered! If you’re running Kodi (or want to run Kodi) on a Windows machine, then head to the Kodi downloads page, and where it says ‘Current release: Kodi v17.6 “Krypton”’, click on the "Installer" link, which downloads the .exe file that will take you through the process of installing Kodi 17.6. If you already have a previous version of Kodi installed, then download the .exe and install Kodi 17.6 in the same location you installed the previous version of Kodi, and that will update your version to Krypton. If you’re using Windows 10 then you can also download Kodi 17.6 Krypton from the Windows Store. To install Kodi 17.6 Krypton on a Mac, or update your existing Kodi installation, go to the Kodi downloads page and select the ‘Installer’ link below the Apple logo. This will download the .dmg file of Kodi 17.6. Double-clicking this file will mount it in Mac OS X or macOS Sierra as a disk image. Open this image, then drag and drop the Kodi.app file from the disk image to your Applications folder. Kodi makes this easy by bringing up a window that lets you do this. As with the Windows version of Kodi, if you want to update your existing Kodi installation to Kodi 17.6 Krypton, simply install the new version over the old one. Kodi 17.6 Krypton is included in Ubuntu repositories, which means it’s straightforward to install Kodi in Ubuntu or an Ubuntu-based distro. Kodi can also be installed on other distributions using third-party repositories, but these aren't officially supported by Kodi, so you may not get the best experience. You can also compile Kodi from source files to run on various Linux distros. The Kodi website has a comprehensive guide to installing from the source code. While you can download and install Kodi software in the default Raspbian operating system that comes with the Raspberry Pi, the latest version of Kodi is not available, which means you won’t be able to install Kodi 17.6 Krypton in Rasbian just yet. However, there are several distros built for the Raspberry Pi that use Kodi, so you can install them. 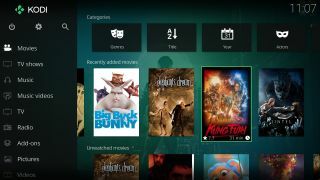 For example, LibreELEC has released a beta version of its software that's based on Kodi 17.6 Krypton. You’ll need to install the LibreELEC (Krypton) v7.95.2 onto an SD card, then insert it into the Raspberry Pi and launch the LibreELEC distro. You can download a LibreELEC USB creator tool, which will do this for you, for Linux, macOS and Windows PC from the LibreELEC Krypton download web page. It’s worth repeating that at the time of writing this is a beta version, so there may be bugs and other issues. Kodi is available from the Google Play store, so head there on your Android device and install the app. Google Play will also automatically update Kodi for you on your device. Kodi Krypton can even work on your Amazon Fire TV or Amazon Fire TV Stick. To install Kodi 17.6 on your Amazon device, you’ll need to first install a downloader and enable app installs from unknown sources. To follow the entire process, check out Techradar’s guide for installing Kodi on Amazon Fire TV and Amazon Fire TV Stick.